Working hard, or hardly working? Business.org researched which states put in the most (and the least) hours on the job every week. But how do American workers stack up against themselves? With a little help from the US Census Bureau’s American Community Survey,2 Business.org worked a reasonable number of hours to compile state-by-state comparisons of who’s laboring longest in our 50+ territories. The information gathered came from workers aged 16 to 64 who’ve participated in the workforce within the past 12 months and included both full- and part-time statuses. Alaska works the most hours (41.6 hours per week). Alaskan men contribute most to that total (44.5 hours per week). Women work longest in Washington DC (38.9 hours per week). Utah works the least (37.3 hours per week). Women work least in Utah (33.2 hours per week). Nevada, New Mexico, and Rhode Island men work the least (three-way tie: 40 hours per week). Washington DC has the smallest work gap between genders (women: 38.9 hours per week; men: 41.3; difference: 2.4). North Dakota has the largest work gap between genders (men: 43.7 hours per week; women: 36; difference: 7.7). Utah has the second largest work gap between genders (men: 40.6 hours per week; women: 33.2; difference: 7.4). Across the board, women work fewer hours than men, and most women work part-time. Oil industry workers put in the most hours; healthcare workers put in the least. Many of these states are among the top crude oil producers in the country,4 which lines up with oil workers toiling for longer hours; all lean toward the industrial end of the occupational scale. As for Washington DC, everyone’s familiar with how time-consuming bureaucracy can be. Ironically, Utah’s motto is “Industry,” and one of its state emblems is the hardworking honeybee. Once again proving consistent with our research, the rest are healthcare-heavy profession states—except for California, which is mostly about producing computers, electronics, and Real Housewives spin-offs. While there’s much talk and opinionating about the demise of the standard 40-hour workweek, our research shows that, at best, US employees have only killed off about 2.7 hours of it. It could also be argued that women are simply working smarter, not longer, than their male counterparts and that everybody should establish a work-life balance and take advantage of their vacation days as often as possible. Burnout is no badge of honor. 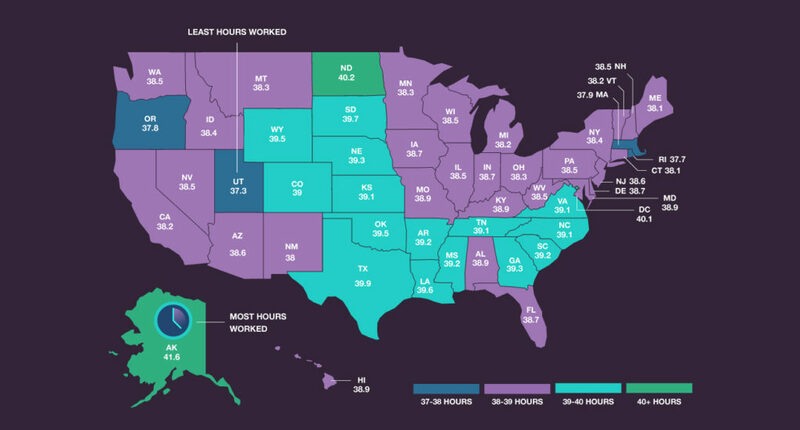 Are you working more than your state’s hours indicate? Or less? Let us know in the comments below.